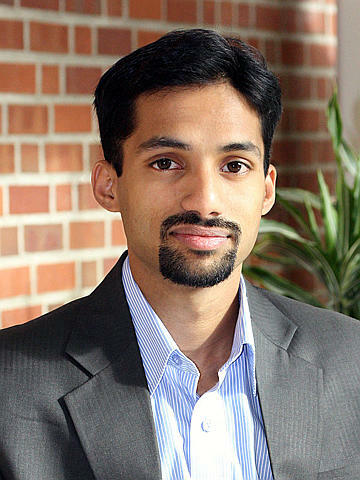 Dr. Arun Devaraj is a Material scientist in the Physical and Computational Sciences Directorate. His research focus is in microstructure-property relationship of metallic alloys, oxides and composite materials. Dr. Devaraj has extensive experience specifically in applying atom probe tomography (APT) for material characterization, in addition to scanning electron microscopy (SEM), energy dispersive x-ray spectroscopy (EDS), focused ion beam (FIB), transmission electron microscopy (TEM), x-ray absorption near edge spectroscopy (XANES), scanning transmission x-ray microscopy (STXM) and in-situ high energy x-ray diffraction (HEXRD) at beamlines of various DOE synchrotron facilities. Specifically Dr. Devaraj is interested in microstructure evolution in metallic alloys used in various structural applications ranging from automotive applications, nuclear materials and other energy related applications. He is also additionally focused on nanoscale characterization of Li/Na ion battery materials, catalysts, high strength natural biomaterials. Structure-property relationship of metallic alloys: Microstructural evolution, Thermodynamics and kinetics of Phase transformation, grain boundary segregation, precipitation, room temperature and elevated temperature mechanical property-microstructure correlation in bulk, surface and joints of materials, Influence of processing by thermo-mechanical treatments on microstructure, understanding effect of ion and neutron irradiation on material microstructure, correlating experimental results with atomic scale computational results from VASP DFT, or MD, montecarlo methods or FEM based theoretical calculations. Atom Probe Tomography: Application of APT for metallic alloys systems, pushing boundaries of application of APT especially for analyzing nanoscale composition of complex oxides, nanoparticles and porous materials used for variety of energy and environmental applications, APT-TEM- level set or FEM APT simulation correlation for understanding and correcting for aberrations in atom probe tomography reconstructions for complex materials. Development of APT for analysis of hard biological materials like teeth of different animals. Multimodal chemical imaging of energy materials by correlating APT analysis with variety of other characterization techniques including TEM, XAS, XRD, NMR and XPS. 2016: Featured in PNNL director Steve Ashby's Column in Tri-City Herald titled "Making better 'stuff' at PNNL." 2016, 2015: Elected as leader for the Microscopy Society of America Atom Probe Tomography Focused Interest Group (MSA APT FIG). 2015: Featured in a news article titled “People behind science” in the local newspaper, Tri-City Herald, as an upcoming young researcher in PNNL. 2016, 2015, 2014: Lead organizer of Atom Probe Tomography focus topic symposium at 61st American Vacuum Society National Meeting. 2015, 2014: People’s choice winner of Science as Art 2014 and 2015 contest, Pacific Northwest National Laboratory. 2014: Selected to represent lightweight vehicles materials research from EMSL at National User Facility Organization (NUFO) congressional science expo, June 10, Rayburn Building, Washington DC. 2013: EMSL Director's award for creativity in research. 2013: Elected as leader-elect officer for the Microscopy Society of America Atom Probe Tomography Focused Interest Group (MSA APT FIG). 2010: Outstanding International Graduate student award by Robert Toulouse Graduate School, University of North Texas. 2008-2011: Elected Graduate Student Representativefor the Department of material Science and Engineering, University of North Texas. Kautz E.J., A. Devaraj, L. Kovarik, C.A. Lavender, and V.V. Joshi. 2017. Effect of Silicon in U-10Mo Alloy. PNNL-26790. Richland, WA: Pacific Northwest National Laboratory. Kautz E.J., S. Jana, A. Devaraj, C.A. Lavender, L.E. Sweet, and V.V. Joshi. 2017. Detecting the Extent of Cellular Decomposition after Sub-Eutectoid Annealing in Rolled UMo Foils. PNNL-26862. Richland, WA: Pacific Northwest National Laboratory. Zang H., W. Liu, T. Li, C. He, D. Yun, W. Jiang, and A. Devaraj, et al. 2017. "VACANCY EFFECTS ON THE FORMATION OF HELIUM AND KRYPTON CAVITIES IN 3C-SiC IRRADIATED AND ANNEALED AT ELEVATED TEMPERATURES." In Fusion Materials Semiannual Progress Report For Period Ending December 31, 2016, edited by Dl Clark. 67-68. Oak Ridge, Tennessee:Oak Ridge National Laboratory. PNNL-SA-124009. Devaraj A., L. Kovarik, V.V. Joshi, S. Jana, S. Manandhar, B.W. Arey, and C.A. Lavender. 2016. High-Resolution Characterization of UMo Alloy Microstructure. PNNL-26020. Richland, WA: Pacific Northwest National Laboratory. Devaraj A., R. Prabhakaran, V.V. Joshi, S.Y. Hu, E.J. McGarrah, and C.A. Lavender. 2016. Theoretical Model for Volume Fraction of UC, 235U Enrichment, and Effective Density of Final U 10Mo Alloy. PNNL-SA-117284. Richland, WA: Pacific Northwest National Laboratory. Devaraj A., S. Jana, C.A. McInnis, N.J. Lombardo, V.V. Joshi, L.E. Sweet, and S. Manandhar, et al. 2016. Detecting the Extent of Eutectoid Transformation in U-10Mo. PNNL-SA-120714. Richland, WA: Pacific Northwest National Laboratory. Prabhakaran R., A. Devaraj, V.V. Joshi, and C.A. Lavender. 2016. PProcedure for Uranium-Molybdenum Density Measurements and Porosity Determination. PNNL-25793. Richland, WA: Pacific Northwest National Laboratory. Wang C.M., Z. Zhu, M.H. Engelhard, A. Devaraj, and D.R. Baer. 2016. "Multimodal and in-situ chemical imaging of critical surfaces and interfaces in Li batteries." Microscopy Today 24, no. 2:32-39. PNNL-SA-115445.